Download "Promotional Materials Agreement IMPORTANT PLEASE READ CAREFULLY"
1 Promotional Materials Agreement IMPORTANT PLEASE READ CAREFULLY Before using Tommy Bahama Group, Inc s ( TBG ) Promotional Materials (as defined below), you (the undersigned) explicitly agree to be bound by this Agreement as set forth in the Terms below as well as any subsequent revisions to the Terms which may be provided to you in writing, or posted on the TBG Promotional Materials Website (as defined below), from time-to-time by TBG. Definitions TBG Promotional Materials: any and all trademarks, names, signs, logos, banners, postcards, posters, counter cards, signs and any other materials, in whatever form, owned and/or used by TBG for the promotion of its company, its products and activities which are made available to you for your use, subject to these Terms. 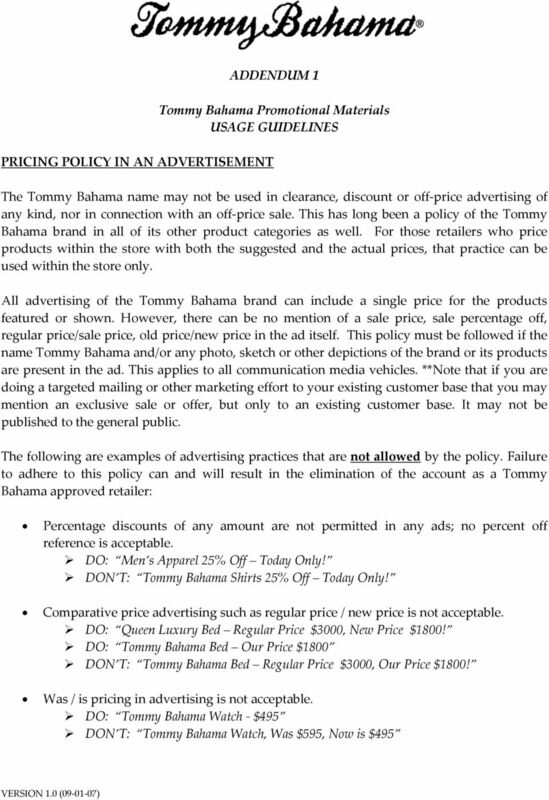 TBG Products: TOMMY BAHAMA, TOMMY BAHAMA RELAX, TOMMY BAHAMA GOLF 18, TOMMY BAHAMA SPA, TOMMY BAHAMA SWIM, ISLAND SOFT INDIGO PALMS, TOMMY BAHAMA DENIM, and TOMMY BAHAMA JEANS branded products, and any derivatives thereof. TBG Promotional Materials Website: any and all elements and contents of the website available under the URL Please note that TBG Promotional Materials may not be downloaded, copied, saved or otherwise obtained from any other source. TBG Ecommerce Website: any and all elements, contents and the look and feel of the website available under the URL or any other URL s from which any TBG Products can be purchased directly from TBG or a TBG Affiliate (as defined below). TBG Affiliate: any corporation, company or other entity that directly or indirectly controls, is controlled by, or is under common control with, TBG. For the purpose of this definition, the word "control" shall mean the direct or indirect ownership of more than fifty percent (50%) of the outstanding voting stock of the corporation, company, or other entity. 2 Use of TBG Promotional Materials You are allowed to use the TBG Promotional Materials, under the conditions as set forth herein. 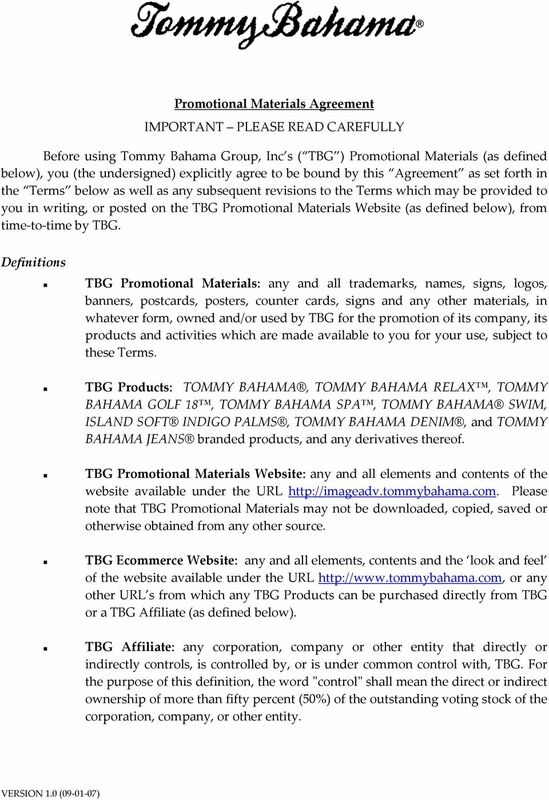 TBG, herewith, grants you a non-exclusive and non-transferable license, without the right to grant sub-licenses, to use the TBG Promotional Materials, at your retail store(s) and / or on your website for the sole purpose of promoting TBG Products. 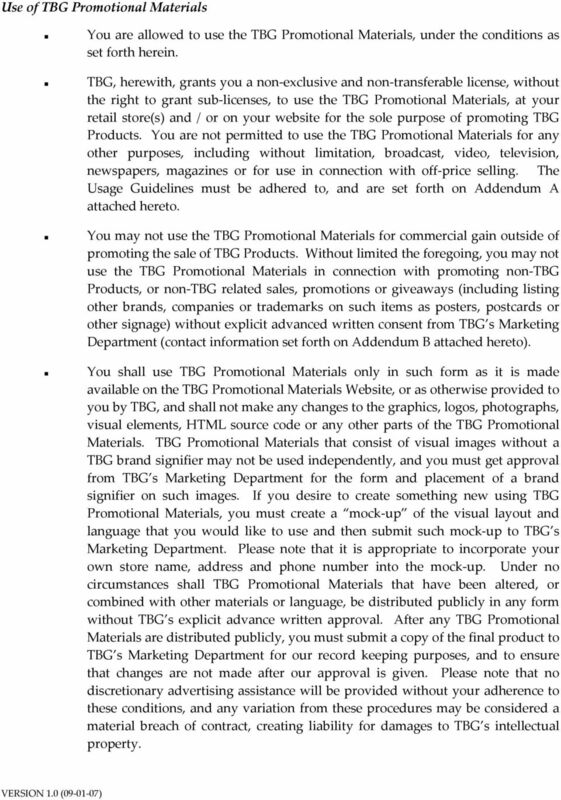 You are not permitted to use the TBG Promotional Materials for any other purposes, including without limitation, broadcast, video, television, newspapers, magazines or for use in connection with off-price selling. The Usage Guidelines must be adhered to, and are set forth on Addendum A attached hereto. You may not use the TBG Promotional Materials for commercial gain outside of promoting the sale of TBG Products. Without limited the foregoing, you may not use the TBG Promotional Materials in connection with promoting non-tbg Products, or non-tbg related sales, promotions or giveaways (including listing other brands, companies or trademarks on such items as posters, postcards or other signage) without explicit advanced written consent from TBG s Marketing Department (contact information set forth on Addendum B attached hereto). You shall use TBG Promotional Materials only in such form as it is made available on the TBG Promotional Materials Website, or as otherwise provided to you by TBG, and shall not make any changes to the graphics, logos, photographs, visual elements, HTML source code or any other parts of the TBG Promotional Materials. TBG Promotional Materials that consist of visual images without a TBG brand signifier may not be used independently, and you must get approval from TBG s Marketing Department for the form and placement of a brand signifier on such images. If you desire to create something new using TBG Promotional Materials, you must create a mock-up of the visual layout and language that you would like to use and then submit such mock-up to TBG s Marketing Department. Please note that it is appropriate to incorporate your own store name, address and phone number into the mock-up. Under no circumstances shall TBG Promotional Materials that have been altered, or combined with other materials or language, be distributed publicly in any form without TBG s explicit advance written approval. After any TBG Promotional Materials are distributed publicly, you must submit a copy of the final product to TBG s Marketing Department for our record keeping purposes, and to ensure that changes are not made after our approval is given. Please note that no discretionary advertising assistance will be provided without your adherence to these conditions, and any variation from these procedures may be considered a material breach of contract, creating liability for damages to TBG s intellectual property. 4 any intellectual property right with you. Furthermore, all goodwill arising from use of the TBG trademarks shall inure to the benefit of TBG. You are not allowed to register any trade names, trademarks, logos, domain names or any other names or signs similar to TBG s intellectual property rights, including but not limited to the TBG Promotional Materials. General Provisions You represent and warrant that you are authorized to agree to and comply with the Terms herein. You acknowledge and agree that your use of the TBG Promotional Materials will be at your own risk and account. 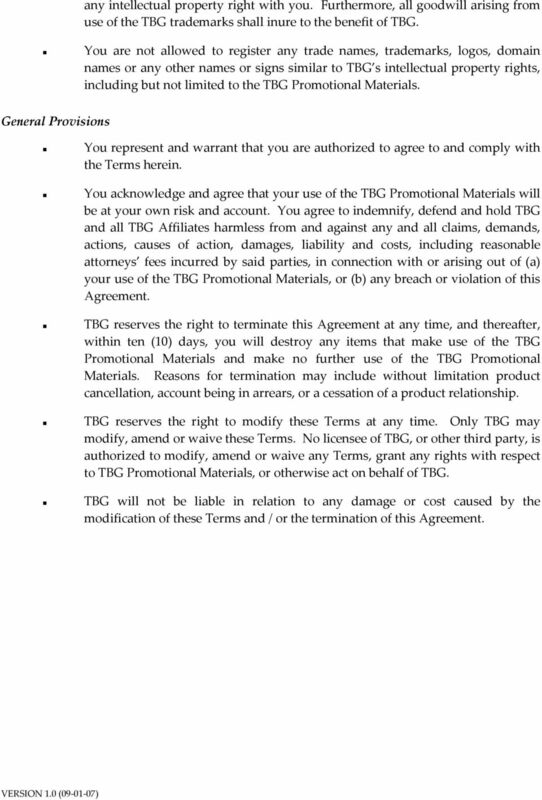 You agree to indemnify, defend and hold TBG and all TBG Affiliates harmless from and against any and all claims, demands, actions, causes of action, damages, liability and costs, including reasonable attorneys fees incurred by said parties, in connection with or arising out of (a) your use of the TBG Promotional Materials, or (b) any breach or violation of this Agreement. 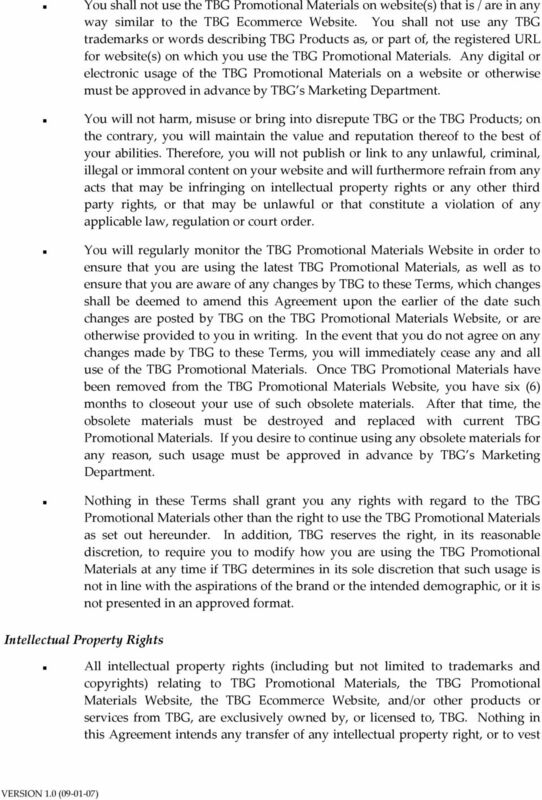 TBG reserves the right to terminate this Agreement at any time, and thereafter, within ten (10) days, you will destroy any items that make use of the TBG Promotional Materials and make no further use of the TBG Promotional Materials. Reasons for termination may include without limitation product cancellation, account being in arrears, or a cessation of a product relationship. TBG reserves the right to modify these Terms at any time. Only TBG may modify, amend or waive these Terms. No licensee of TBG, or other third party, is authorized to modify, amend or waive any Terms, grant any rights with respect to TBG Promotional Materials, or otherwise act on behalf of TBG. TBG will not be liable in relation to any damage or cost caused by the modification of these Terms and / or the termination of this Agreement. 7 BRAND IDENTITY It is essential that the identity of the Tommy Bahama brand is maintained and communicated properly through marketing and advertising. 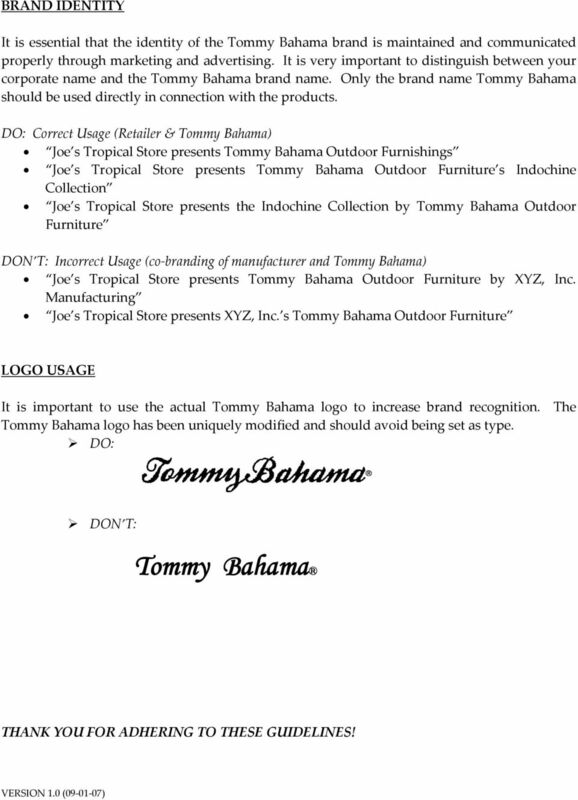 It is very important to distinguish between your corporate name and the Tommy Bahama brand name. Only the brand name Tommy Bahama should be used directly in connection with the products. DO: Correct Usage (Retailer & Tommy Bahama) Joe s Tropical Store presents Tommy Bahama Outdoor Furnishings Joe s Tropical Store presents Tommy Bahama Outdoor Furniture s Indochine Collection Joe s Tropical Store presents the Indochine Collection by Tommy Bahama Outdoor Furniture DON T: Incorrect Usage (co-branding of manufacturer and Tommy Bahama) Joe s Tropical Store presents Tommy Bahama Outdoor Furniture by XYZ, Inc. Manufacturing Joe s Tropical Store presents XYZ, Inc. s Tommy Bahama Outdoor Furniture LOGO USAGE It is important to use the actual Tommy Bahama logo to increase brand recognition. The Tommy Bahama logo has been uniquely modified and should avoid being set as type. 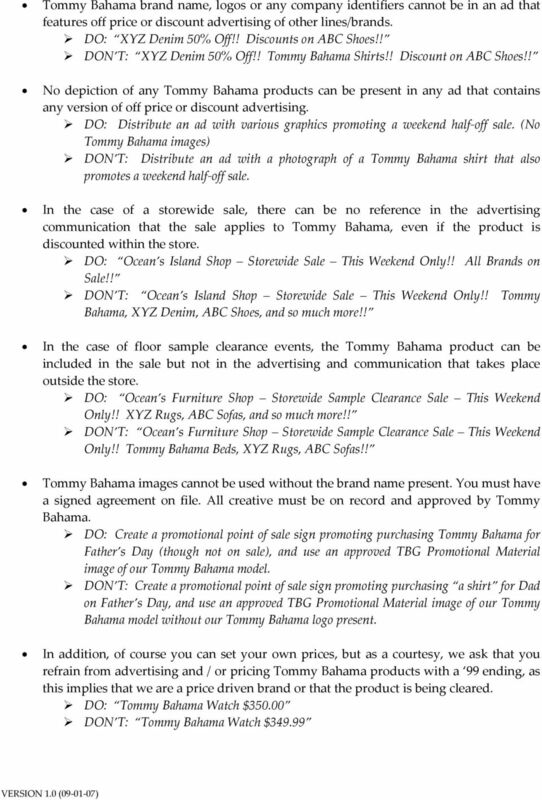 DO: DON T: Tommy Bahama THANK YOU FOR ADHERING TO THESE GUIDELINES!